Please be sure to always download the latest expense report form! This will adjust your invoice by 25% and send you an update and then you can complete payment online. 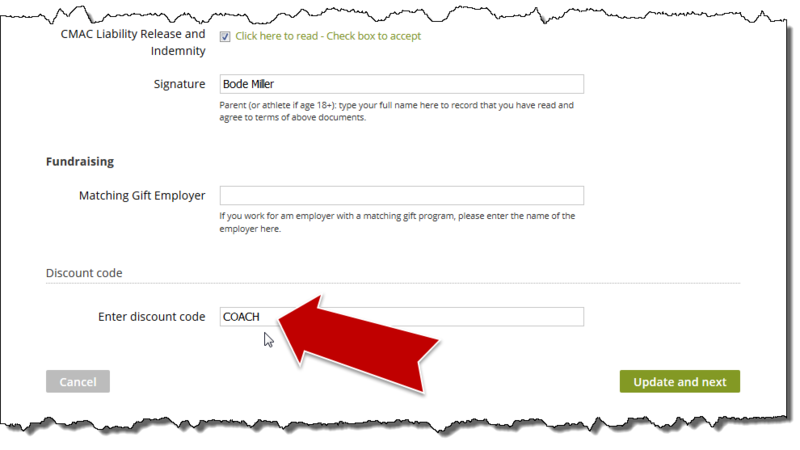 Registering a child of a coach/race crew for CMAC camps? To get the discount for full-time (not substitute) coaches, register for the camp, but before you pay for the camp, email Dale Koetke (CMAC program administrator) at programadmin@cmacskiracing.com to get the camp invoice adjusted. Learn about US Ski and Snowboard's SafeSport Code. Reminder: within the two weeks before a race, it is imperative that the on-hill facilities are validated (e.g. timing wires are intact and available etc.) Looking for a list of coaches or race crew? You can find that here.